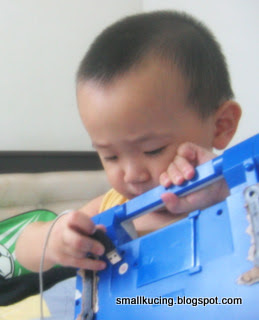 Gotta blog about it.Now ...where to "sumbat" this wire to my toy laptop ah? Nice or not? Eh...by the way, anyone know what's the Chinese writing saying ah? Please translate can ah? Ah...this one Mamarazzi know. In English. What a witty wish? Can't see? Just click at the photo and enlarge it to see what Auntie Merryn wrote. Thank you very much, Auntie Merryn. Happy and Paws-perous Chinese New Year to you and your family too. No, I am not a professional photographer. Since I began blogging in Nov 2008, my awareness of my surrounding has increased. I take my little camera everywhere. CNY already. We don't celebrate CNY here, I give my kids their hong baos. Husband has gone to China, so CNY will just be any other day. What!! SK oso "chinese-character blind"? Paw paw = the tiger's paw lor....ceh! Auntie Merryn, I want Ang Pau too.....pleeesssee! ha ha ha! 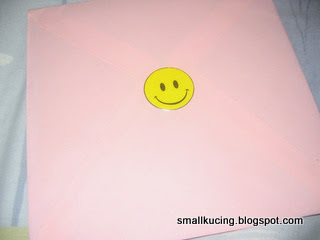 I also got this smiley envelope hehe. She is thoughtful. 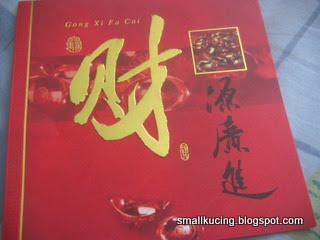 The chinese word is ' choi yuen goung zhun'. 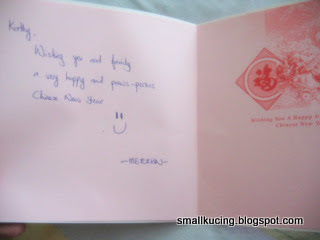 Merryn is such a sweet lady that I think she is the only one that I know still sending cards.. so thoughtful..
wah...very hi-tech wor, angpau via paypal.Wei...u wan angpau must go visiting mah...bring along your good tasty food too as "hand letters". Wah this card very "mujarab" wor.